The integrity of DNA molecules is fundamental for maintaining life. The DNA repair proteins protect organisms against genetic damage, by removal of DNA lesions or helping to tolerate them. DNA repair genes are best known from the gamma-proteobacterium Escherichia coli, which is the most understood bacterial model. However, genome sequencing raises questions regarding uniformity and ubiquity of these DNA repair genes and pathways, reinforcing the need for identifying genes and proteins, which may respond to DNA damage in other bacteria. In this study, we employed a bioinformatic approach, to analyse and describe the open reading frames potentially related to DNA repair from the genome of the alpha-proteobacterium Caulobacter crescentus. This was performed by comparison with known DNA repair related genes found in public databases. As expected, although C. crescentus and E. coli bacteria belong to separate phylogenetic groups, many of their DNA repair genes are very similar. However, some important DNA repair genes are absent in the C. crescentus genome and other interesting functionally related gene duplications are present, which do not occur in E. coli. These include DNA ligases, exonuclease III (xthA), endonuclease III (nth), O6-methylguanine-DNA methyltransferase (ada gene), photolyase-like genes, and uracil-DNA-glycosylases. On the other hand, the genes imuA and imuB, which are involved in DNA damage induced mutagenesis, have recently been described in C. crescentus, but are absent in E. coli. 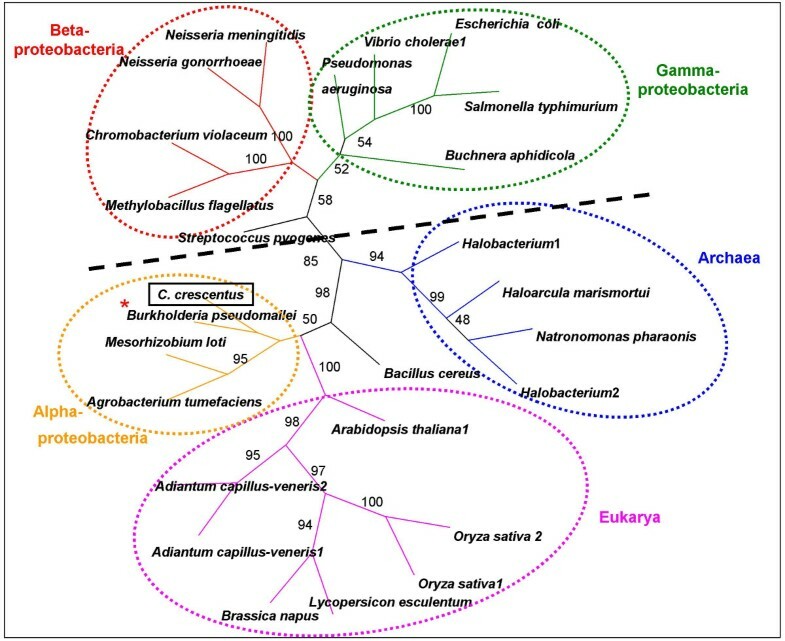 Particularly interesting are the potential atypical phylogeny of one of the photolyase genes in alpha-proteobacteria, indicating an origin by horizontal transfer, and the duplication of the Ada orthologs, which have diverse structural configurations, including one that is still unique for C. crescentus. The absence and the presence of certain genes are discussed and predictions are made considering the particular aspects of the C. crescentus among other known DNA repair pathways. The observed differences enlarge what is known for DNA repair in the Bacterial world, and provide a useful framework for further experimental studies in this organism. The removal of lesions from the DNA molecule depends, mostly, on cellular DNA repair capacity. Several highly conserved mechanisms efficiently remove those DNA lesions that frequently occur in the cell's genetic material, thereby ensuring genomic integrity. Most of what is known for bacterial DNA repair mechanisms derives from studies in E. coli. However, genome sequencing has revealed a large number of genes with unknown functions, and clear differences raise questions on the ubiquity of similar DNA repair pathways within the bacterial kingdom. For example, it was recently described for Mycobacterium tuberculosis that the induction of functional DNA repair genes by DNA lesions is not entirely dependent on RecA protein. In fact, there are at least two induction pathways for DNA repair genes in this gram-positive bacterium . Alpha-proteobacteria include soil bacteria such as those involved in the global nitrogen cycle (Bradyrhizobium, Mesorhizobium, Nitrobacter, Sinorhizobium and Rhizobium), plant tumor-inducing bacterium (Agrobacterium), and bacteria frequently found in water (Candidatus, Caulobacter, Erythrobacter, Jannaschia, Sphingopyxis, Silicibacter). In this group of bacteria, pathogenic organisms are also included (Anaplasma, Bartonella, Brucella, some species of Wolbachia, Rickettsia and Ehrlichia). Other members present environmental interest as ethanol producers (Zymomonas), or by their capacity for degrading a wide range of toxic organic compounds, thereby assuming a bioremediation role (Novosphingobium, Rhodopseudomonas and Rhodobacter). The species Gluconobacter oxydans, by being able to oxidize a wide variety of substrates, has a great importance within the food and pharmaceutical industries [2, 3]. The aquatic bacterium Caulobacter crescentus is an important model organism for studies on bacterial cell cycle and differentiation, but as for other alpha-proteobacteria, very little is known about its DNA repair pathways. C. crescentus has the ability to survive in low-nutrient environments, and produces two different cell types (a sessile stalked cell and a motile swarmer cell) which are, in fact, important life forms of its cell cycle . Its genome, composed of 4,016,942 base pairs, encodes 3,767 genes . The availability of the complete genome sequence from C. crescentus allows for an "in silico" analysis which may contribute towards understanding the strategies this bacterium uses to live, including how it processes its DNA molecule. For DNA repair studies, photoreactivation was established in alpha-proteobacteria when C. crescentus  and Rhodobacter  bacteria were irradiated with ultraviolet (UV), and photorepair was observed when submitted to high doses of visible light. In both bacteria, genes that code for proteins of the photolyase family may perform this function. An alk B mutant in C. crescentus was shown as highly sensitive to the alkylating agent methyl methanesulfonate (MMS), and the expression of this gene is dependent on the cell cycle of the bacteria . Additionally, DNA polymorphism at the alkB locus was previously described in Brucella abortus . Recently, this gene has been described as related to a new DNA repair pathway, oxidative demethylation . The description of a constitutive O6-methylguanine-DNA methyltransferase in Rhizobium meliloti confirms the presence of a third DNA damage reversal mechanism in the alpha-proteobacteria group . The reactivation of bacteriophages in C. crescentus exposed to 5–10 J/m2 of UV , the phenotypic characterization of mutants for uvrA, uvrB and uvrC in order to investigate the sensitivity to radiation in Rhodobacter sphaeroides , and functional complementation studies in Sinorhizobium meliloti  indicate the existence of an SOS response in these alpha-proteobacteria. This is confirmed by the identification of the rec A and lex A orthologs, which control the SOS regulon. In addition, several other studies have been carried out to unravel the SOS box in this group of bacteria [14–18]. Recent studies demonstrate the importance of DNA repair pathways in heavy metal stress in C. crescentus . The phenotypes of mutants in the xthA gene of Brucella abortus  correlate well with the function of this gene in base excision repair (BER), as already described in E. coli. Finally, Galhardo et al  characterized the imuAB dnaE2 operon, indicating that it is involved in DNA damage induced mutagenesis under SOS regulon control in C. crescentus. However, in the same work, there was no evidence that another translesion DNA polymerase, DinB, was controlled by the SOS response in this bacterium, raising the possibility that a different regulatory pathway may be operational for this gene in this bacterium. Here we present a comparison of the main DNA repair genes between C. crescentus and E. coli. For this analysis, we searched for open reading frames (ORFs) in the C. crescentus genome that present a significant similarity with known DNA repair related genes, especially those from E. coli. As the genes involved in DNA repair are, in general, part of the cell core metabolism, they maintain a strong similarity in different bacterial genomes, but intriguing differences suggest biological diversity in bacterial responses to DNA damage. This "in silico" study provides important insights regarding DNA repair pathways in C. crescentus, and those of the alpha-proteobacteria group, thereby giving a direction for further functional characterization. The genome of C. crescentus was screened for the presence of genes known to act in the metabolism of DNA lesions, most in E. coli. This comparison lead to the identification of many of the DNA repair related pathways. In order to facilitate comprehension of the main similarities and differences among these genomes, genes have been classified as: 1-Excision repair (base excision repair, nucleotide excision repair and mismatch repair); 2- Direct repair (photoreactivation, alkyltransfer and oxidative demethylation); 3- Recombinational repair and 4- Other DNA repair related proteins. The BER pathway has been found in all living organisms, and involves several different proteins with the functions of DNA glycosylases and endonucleases. These enzymes are able to remove damaged bases induced by different means, such as those lesions spontaneously generated by oxidative stress. In BER, damaged bases are removed from the DNA backbone in a free form by specific DNA glycosylases, leaving an abasic apurinic or pyrimidinic (AP) site. An AP-endonuclease nicks the DNA at the position of these abasic sites, and subsequently a repair patch is synthesized, thus restoring the original molecule . The main genes involved in BER are listed in Table 1. There are two main types of DNA glycosylases, the Fpg/Nei and Nth/MutY families, both represented in the genome of C. crescentus. In addition to their glycosylase activity, several of these enzymes also display a lyase activity that cleaves the phosphodiester backbone 3' to the AP site, so they are known as bifunctional glycosylases. Although a Nei ortholog was not found, the Fpg protein may participate in the removal of oxidative lesions in this bacterium. The exonuclease III, coded by the xth A gene, is responsible for most AP-endonuclease activity in the BER system in E. coli. In C. crescentus, we found two distinct close orthologs of exonuclease III (xthA 1, xthA 2), but this does not necessarily represent redundancy. The second ortholog of XthAmay compensate for the absence of the endonucleases Nfo and Nfi. The gene for the other protein of the same family, mutY, is also found in one copy. a. numbers indicate similarity within local alignment in aminoacids (aa). The ung/udg gene, which encodes uracil-DNA glycosylase, is critical for the removal of uracil from DNA. Uracil, which is normally misincorporated during replication, may also result from cytosine deamination, yielding C to T transition mutations . The presence of four genes coding for proteins of the uracil-DNA-glycosylase family in C. crescentus suggests the importance of deamination of cytosine in this genome. Although they have no significant sequence similarity to the UDG protein found in E. coli, they all belong to the UDG family (COG1573) previously described in Thermotoga maritima . Thus, these proteins may be important for the stability of this G:C rich genome . Orthologs of the AlkA and Tag, which are the main proteins responsible for the repair of methylated bases in E. coli by BER, are also found in C. crescentus genome. Distortion in the double helix caused by certain lesions seems to be the first signal for the recognition of damage by the NER system, which is capable of recognizing a larger variety of base modifications, using more generic endonucleases than the BER system. Lesion removal in the intact oligonucleotide form, instead of as free bases as seen in BER pathway, is performed by the sequential action of damage recognition proteins, nuclease and helicase proteins, followed by DNA polymerization and ligation by DNA ligase . This pathway, which mainly consists of the proteins UvrA, UvrB, the nuclease UvrC, the helicase UvrD and the dsDNA translocase Mfd, is complete in C. crescentus (Table 2). It is interesting to note that in C. crescentus there are three copies of small genes corresponding to an endonuclease domain (COG2827). This domain  is also observed in the N-terminal portion of the UvrC protein, and the genes are often annotated in the genomes of several other organisms such as "UvrC-like protein, N-terminal". Although the role of these potential endonucleases in the repair of C. crescentus is unknown, other proteins, also containing a similar domain, have likewise been observed, as is the case of the protein encoded by cho (uvrC ho molog) gene of E. coli. Cho protein is a homolog to the N-terminus of UvrC, and makes a DNA incision at 3' from certain types of DNA damage, where UvrC is less efficient . Cho is a damage inducible protein whereas UvrC is not, both being found together only in few bacteria . Some of the Cho homologs, particularly those belonging to the beta proteobacteria group (Table 3), present an N-terminus fusion with a putative 3'exonuclease domain, similar to the epsilon subunit of DNA polymerase III. These two activities (endonuclease and exonuclease) of this fusion protein were proposed to act in coordinate and sequential functions in a new DNA repair mechanism . These C. crescentus UvrC-like endonucleases encode proteins with sizes ranging from 96 to 123 amino acid residues, and are widespread in proteobacteria of the alpha group, although they can also be found in other bacterial groups (Table 3). Although these paralogs may indicate functional redundancy, they may play roles similar to those of the Cho protein. In other words, they may act in NER, but on different types of DNA damage, being back up enzymes for the UvrC protein. In support of this hypothesis, there is strong relationship between the presence of cho genes and the absence of these endonuclease genes in several bacterial genomes, as it is shown in Table 3. But whether these small endonucleases share with the Cho protein similar mechanisms for incision, and which lesions they recognize, remain open questions. In Figure 1, a scheme representing the UvrC and the UvrC-like proteins illustrates their different domains. Although these putative endonucleases share low similarity with the larger Cho protein, they all contain a similar domain (COG2827). It is important to mention that one of these UvrC-like genes in C. crescentus (CC3518) presents an SOS box, indicating that it is under control of the LexA repressor control and is part of the SOS regulon . This reinforces the hypothesis that this protein acts in DNA repair mechanisms. Distribution of UvrC and UvrC-like proteins in different bacterial genomes. Scheme for the UvrC and UvrC-like proteins. The yellow boxes characterize putative endonuclease domains. In red box is shown the C-terminal domain of UvrC, and in gray box the epsilon subunit of DNA polymerase III. Transcription-coupled repair is most likely to be functional in the C. crescentus genome, since the gene mfd and the complete NER pathway are found in this genome. Mfd is a well conserved bacterial protein which is a coupling factor for NER with transcription. In E. coli the enzyme encoded by this gene is capable of removing the transcription complex when it is found stalled on damage, leaving room for DNA excision repair recruitment to the site of a DNA lesion . The MMR pathway acts as an editor, correcting mismatched base pairs introduced in DNA by several processes, including replication and recombination. The complex MutS/MutL recognizes a DNA replicative error or misalignment, followed by excision of the section containing the mismatch . In C. crescentus, MMR is probably performed by mutS/mutL homologs (Table 4). In E. coli, MutH is an endonuclease that participates in the recognition of GATC methylated sequences, discriminating the DNA strand to be repaired by MMR. In C. crescentus, there is no mutH homolog, which correlates well with the absence of dam homologs that normally perform GATC methylation. However, it should be remarked that mutH homologs are rarely found in other bacterial genomes. Therefore, this implies that C. crescentus and other bacteria must use different proteins for strand recognition and incision to complete MMR. Very short patch (Vsp) repair is initiated by the action of the protein Vsr, which is also an endonuclease. This pathway corrects T:G mismatches to C:G base pairs, if this mismatch is within a hemi-methylated Vsr recognition site. The endonuclease activity of Vsr, responsible for cutting 5' of the misplaced T, is stimulated by MutL in E. coli . An ortholog of Vsr is found in the C. crescentus genome, but its function remains to be confirmed. Several repair mechanisms revert lesions in DNA, removing damage by a single step. The reversion can be achieved by photoreactivation, alkyltransfer and oxidative demethylation. The corresponding genes found in C. crescentus are shown in Table 5. The mechanism of photoreactivation is performed by enzymes known as photolyases, which employ visible light as energy source to monomerize pyrimidine dimers induced by UV irradiation. The photolyase family includes repair proteins (photolyases) and blue light receptors (cryptochromes), the common feature of these proteins being the presence of a FAD chromophore as cofactor. These genes are well conserved and are found throughout the three domains of life, from bacteria to aplacental mammals . Only one photolyase is found in E. coli, while C. crescentus has two putative homologs of this family (Table 5), although one of these is only photolyase-related, and its function in DNA repair is not clear. A phylogenetic tree for the main Phr proteins is presented in figure 2. The photolyase-related gene was not included as it is highly divergent. Curiously, the C. crescentus protein is located far from the known bacterial photolyases and closer to the branch where the Eukaryotes (mainly plants) are found. On the other hand, some recently described phr bacterial orthologs (from another alpha-proteobacteria and some firmicutes) are also in the same branch. It is difficult to establish the origin of such a gene, as it may have occurred from an old duplication later lost in most of the bacterial species. Alternatively, this could represent a potential horizontal gene transfer event involving Eukarya and Bacteria. Tree topology also indicates that the C. crescentus phr gene may not be involved in DNA damage repair, as their known orthologs of plants are Cry1 genes, which are blue light photoreceptors related only to the regulation and development of plant growth . Although this phylogenetic approach has been very useful for gene function predictions , the participation of the C. crescentus phr gene in photorepair must be determined experimentally. Consensus unrooted tree generated by the Neighbor-Joining distance method for the Phr protein. The symbol * indicates the beta proteobacteria in a different bacterial group. The circles highlight the main groups of Bacteria, Archaea and Eukarya. The homolog of C. crescentus is indicated inside the square box. Proteins participating in this mechanism, products of the ada and ogt genes, are alkyltransferases which transfer alkyl adducts from damaged DNA to themselves, in a non-enzymatic suicide mechanism . Ada is also an important and interesting protein involved in gene expression regulation. The protein is normally comprised of a N-terminal regulatory domain, and a C-terminal catalytic domain, but other bacteria present other forms of gene organization (Figure 3). 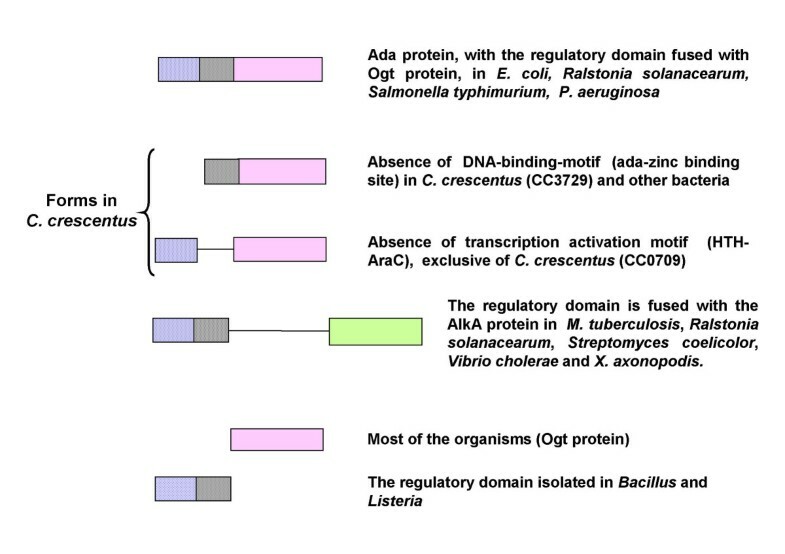 In E. coli the regulatory and alkyltransferase functions are present in the product of a unique gene (ada). Homologs to the alkyltransferase domain (normally called Ogt, for O6-alkyl-guanine transferase) also occur independently of the regulatory Ada domain, and are present and highly conserved in several organisms of the three domains of life . Thus, this may be an ancient protein, and the Ada protein is probably a result of domain fusion. The regulatory domain also appears fused with an alkyl glycosylase domain in some bacteria. This domain, related to the AlkA protein of E. coli, is also important in the process of removing alkylated bases from DNA (BER). Interestingly, the Ralstonia genome presents genes that encode for both combinations of Ada proteins (Ada-Ogt and Ada-AlkA). In other organisms such as Bacillus subtilis  and Listeria, two different genes encode each domain separately, thus reinforcing the idea of gene fusion as the origin of Ada organization. While in Bacillus subtilis the two domains overlap by 11 base pairs, those in Listeria are arranged in the opposite direction. Representation of the regulatory domain patterns, the alkyltransferase of the Ada, and the Ogt proteins in Bacteria. The regulatory portion of ada is represented by blue and gray boxes, respectively the DNA binding (ada-zinc binding site) and transcriptional activation (HTH-AraC) domains. The alkyltransferase domain, also present in the Ogt protein, is represented by pink boxes. The green box characterizes the AlkA domain, which is involved in the removal of alkyl groups in the base excision repair pathway. The AlkA protein is fused to the regulatory portion of Ada protein in some organisms, as shown. In the C. crescentus genome there are four orthologs of the alkyl transferase gene, two that do not present any N-terminal regulatory domain (ogt orthologs), and two that have the regulatory domain similar to the E. coli ada gene (Table 5). The presence of these four genes reinforces the importance of this type of repair for this free-living bacterium. However, the two ada orthologs of C. crescentus are different as regards the regulatory domain, not previously described. The commonly found regulatory ada domain found in nature comprises two different protein motifs: one related to DNA binding (ada-zinc binding site)  and one potentially responsible for a transcriptional activation (HTH-AraC) . In the two C. crescentus ada orthologs, the N-terminus lacks either one or the other of the portion motifs. While homologs of the gene lacking DNA-binding-motif (CC3729) are found in many other bacteria, the copy lacking the transcription activation motif (CC0709) is still unique for the C. crescentus genome. The meaning and role of such different alkyl transferase orthologs in this bacterium deserve further experimental investigation. Alkylated damage may also be repaired through oxidative demethylation . In E. coli, the single gene participating in this pathway is alkB, whose transcription is under ada gene regulation. This protein is well conserved with homologs in various organisms, including human beings. The protein removes the methyl group from 1-methyladenine and 3-methyl-cytosine, by an alpha-ketoglutarate dependent oxidative reaction, releasing formaldehyde, and healing the damage . An alkB ortholog is found in the C. crescentus genome, and the phenotype of a mutant strain confirms hypersensitivity to the alkylating agent MMS . These results validate the role of the alkB ortholog for the repair of alkyl DNA lesions in C. crescentus. Recombinational repair is crucial in maintaining genome integrity, since it is necessary for repairing single-strand gaps and double-strand DNA breaks or restoring the replication fork. In E. coli, there are two pathways that act independently of each other to initiate recombinational repair. The so-called RecBCD and RecFOR pathways recruit RecA to single-stranded DNA, to initiate the repair of double strand breaks or of post-replication daughter-strand gap, respectively . The RecBCD pathway is absent in C. crescentus (Table 6), but this may be replaced by a functionally equivalent pathway, AddAB, as it has been shown for another alpha proteobacterium, Rhizobium etli . The RecBCD function can also be provided, in part, by RecFOR, as has been suggested for D. radiodurans  and for E. coli, where the viability of RecBCD mutants is restored by the RecFOR pathway . On the other hand, the absence of the complete SbcBCD anti-recombination pathway may be related to the absence of RecBCD, as this is also observed for genomes from other alpha-proteobacteria and mollicutes . Putative recombinational repair genes of C. crescentus. a. numbers indicate similarity within local alignment in aminoacids (aa). * These genes have coverage lower than 50%. The initial step of recombination is followed by the resolution of the Holliday junction by helicase and endonuclease activities, performed by members of RuvABC, a pathway that is complete in C. crescentus. The presence of another gene in C. crescentus (CC1283), an ATPase related to ruvB subunit, the only redundancy present in the recombinational repair pathway in this bacterium, should be mentioned. The lack of homologs of recE and recT genes is not surprising as these are encoded by a prophage being restricted to some E. coli K12-strains. Moreover, genes involved in the non-homologous end-joining pathway of DNA repair (similar to the Ku proteins of Eukaryotes) that have been identified in a number of bacterial species  were not found in C. crescentus. The SOS regulon is a set of physiological responses to damage in DNA. In E. coli, this is well described and involves the participation of more than 40 genes . Under normal conditions, the LexA protein curbs the expression of SOS genes by binding to their promoters. The induction of such a system stems from the coprotease activity of the protein RecA, which inactivates the LexA repressor. The presence of the main regulatory genes of the SOS response (lexA and recA) in C. crescentus (Table 7) indicates a similar SOS regulon. However, the number of genes under SOS control remains to be investigated in C. crescentus. The SOS functions are normally induced in response to stress conditions to ensure survival, but the mutation rates can be increased. The genes umu C and umu D form a complex UmuC/UmuD2, known as DNA polymerase V , being responsible to a large degree for the induced mutagenesis by the SOS system in E. coli, but this polymerase is absent in C. crescentus. It is intriguing that the SOS inducible and error prone DNA polymerase IV (din B), also involved in translesion synthesis in E. coli , presents a different regulation in C. crescentus. In fact, the SOS induced mutagenesis in C. crescentus has been shown to be promoted by enzymes encoded by an operon, including a second copy of DnaE (the catalytic subunit of DNA polymerase III) and other genes named imuA and imuB . Orthologs to imuAB and dnaE2 genes are found in many other genomes, indicating that this enzymatic machinery is widely implicated in stress induced mutagenesis and contributes to genetic variability in the bacterial domain. The nudix-hydrolase superfamily includes the E. coli MutT, which hydrolyses 8-oxodGTP, avoiding its incorporation during DNA synthesis, and other genes that may also be involved in the sanitization of the nucleotide pool . The existence of several proteins of this family in bacterial genomes is quite common, and, for example, in D. radiodurans 22 proteins of such family have been identified . In C. crescentus, we have found 11 proteins (Table 7) that share the NUDIX motif, but CC0833 is most probably the mutT ortholog. The recX gene, which codes for a negative regulator of the RecA function in E. coli, has been detected in most bacterial species [53, 54]. However, RecX homologs were not found in C. crescentus or in other alpha proteobacteria, suggesting a different type of RecA regulation for this group of bacteria. The DNA ligases are essential enzymes in the process of repair, replication and recombination, joining the recently synthesized DNA to the intact strand of DNA. They comprise two families: the ATP-dependent (type II family) ligases are characteristic of Eukaryotes and Archaea, and the NAD-dependent (type I family) ligases are characteristic of Bacteria. Sometimes, both families are present in bacteria, as is the case of C. crescentus (Table 7). The participation of the ATP-dependent ligase in DNA recombination and repair has been proposed . The helicases change the structure of DNA and RNA to allow for the access to transcriptional machinery. The gene lhr encodes a large helicase. The restricted distribution of this helicase in bacteria and its common duplication among the Archaea suggest that the gene may be a recent acquisition, through horizontal gene transfer, by some bacteria . In C. crescentus, we have identified one copy of this gene as is shown in Table 7. Another interesting DNA-dependent ATPase and helicase is the DinG protein, and a homolog was found in C. crescentus (CC2038) . This protein is a bacterial homolog for human helicases that are known to participate in DNA repair, and mutations have been related to some human genetic diseases. As very little is known about DNA repair in C. crescentus, the relevance of this comparative analysis is to provide the basis for investigating the putative genes and pathways detected in the genome of this bacterium. Many of the predictions generated through bioinformatic analyses also contributed to the identification of many gene duplications and modifications, which raised potentially different strategies of DNA repair in C. crescentus and other related bacteria. DNA repair genes represent the core DNA metabolism, are in general strongly conserved, and C. crescentus has, as expected, many similarities to E. coli. However, the absence of some orthologs may reflect components of proteins that can be backed up by other repair pathways, as for the RecBCD complex. Otherwise, the main genes related to BER and NER pathways, including transcription-coupled repair, are detected in C. crescentus, as well as many of the recombinational repair genes. As in E. coli, an SOS regulon is found in C. crescentus, since the main genes (recA and lexA repressor) are identified, although SOS induced mutagenesis is related to a different mechanism . C. crescentus also has some interesting non-identical gene duplications which include DNA ligases, the main subunit (DnaE) of DNA polymerase III, exonuclease III and alkytransferases. Interesting gene structures were identified for the alkyltransferases, one of which is still unique for C. crescentus. Although most of the in silico inferences must be confirmed and tested by experimentation, this work provides a profile of those genes responsible for the maintenance of genome stability in C. crescentus, contributing to the understanding of the mechanisms of genome protection and mutagenesis in alpha-proteobacteria. It also provides a useful framework for further investigations on the functions of these genes. The putative ORFs in C. crescentus and E. coli were compared with known DNA repair related genes in public databases using the BlastP search in Genebank non-redundant (nr) database . In some specific cases, potential DNA repair genes in C. crescentus genome (GenBank accession n° AE005673) were identified both by sequence similarity searches (using as seed sequences orthologs from other organisms) and keyword searches. C. crescentus candidate genes were thus confirmed both by sequence similarity searches (BlastP program) and domain analysis. Phylogenetic trees were generated for a group of Phr protein homologs. Protein sequences were aligned using the ClustalX multiple sequence alignment program  with manual adjustment with Genedoc (v2.6.02). Only unambiguously aligned positions (excluding poorly conserved and gap regions) were used in phylogenetic analysis, which was performed using the Phylip program version 3.5 . Parsimony analysis was conducted using the Protpars program, whereas distance methods were performed using the Neighbor-Joining  method in Phylip. The distance matrix was constructed using a PAM matrix model . Bootstrap support (resampled 1,000 times) was calculated, and strict consensus trees constructed. Only bootstrap values greater than 50% are shown. Similar topologies were found for both algorithms employed, only Neighbor-Joining being displayed. The consensus trees obtained were viewed through TreeView software . In this work, the option for non-rooted trees aims at demonstrating only the relationship among organisms, without, however, linking ancestors and descendants. Organism names with the accession code of the Phr and Phr-like proteins analyzed are shown in Table 8. Genes of DNA photolyase/cryptochrome protein family investigated in the phylogenetic analysis. The organisms are listed in alphabetic order within the taxa. The authors thank Dr. Alice Reis de Oliveira (University of São Paulo, Brazil) for manuscript revision, and Drs. Rodrigo S. Galhardo and Marilis V. Marques (USP, Brazil) for their continuing support in our work with DNA repair in C. crescentus. Financial support was obtained from FAPESP (São Paulo, Brazil) and CNPq (Brasília, Brazil). MM-P performed gene search and functional classification, and together with CFMM, designed, conceived the ideas and the writing of the manuscript. RCPM helped on gene analysis. All authors read and approved the final manuscript.